who was known to be just and kind-hearted. This was the first migration in Islam. 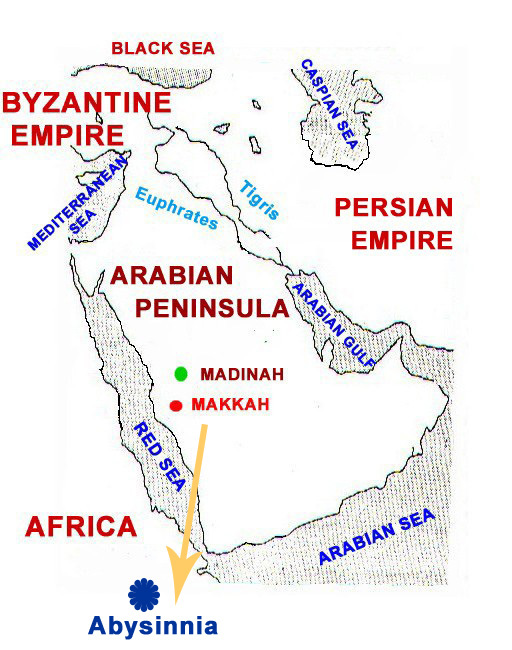 A group of twelve Muslims left for Abysinnia with Uthman Ibn Maz’un Radhi Allahu Anhu as their leader. The news that the Muslims were living in peace reached Makkah and the Quraish could not accept this. They decided to send Abdullah Ibn Abu Rabiáh and Amr Ibn al As Ibn Wa’il with lavish gifts and (plan) to bribe the Negus and convince him to return the Muslims to them. But, the Negus disliked forsaking those who had sought his shelter. He said, “No, By Allah, I will not surrender them.” He summoned the Muslims to his court and asked them to explain to him what their religion was all about. and our strong oppressed our weak. This is how we lived until Allah raised among us a prophet whom we knew His noble birth, lineage, truthfulness, honesty and purity we knew. To worship Him and to renounce the stones and idols we and our forefathers used to worship. to be kind and considerate to our family and neighbours. And He asked us not to encroach upon the wealth of orphans or to vilify chaste women. and never worship or associate partners with Him. He ordered us to offer prayers, to pay the Zakaah (Right of the poor) and to fast. We acknowledged his truth and believed in him. We followed him in whatever he brought from Allah. We worshipped only one Allah without associating partners with Him. We treated as unlawful what he forbade and we accepted what he made lawful for us. For this our people persecuted us, they tried to mislead us from our faith and forced us to return to idol worship and the other evils we used to commit before. When the Negus heard this he treated the Muslims with honour and pledged his protection to them. The next day the envoys of the Quraish hatched another plot to convince the Negus. They said that the Prophet Sallallahu Alaihi Wasallam and his followers blasphemed Jesus. The Negus again asked Ja’far Radhi Allahu Anhu about this. Ja’far Radhi Allahu Anhu replied by reciting the opening verses of Surah Maryam. Negus wept until his beard was wet and the bishops wept until their scrolls were wet with tears. The messengers of the Quraish were forced to leave Abysinnia in shame. After a while the Quraish spread a false rumour that they had all accepted Islam. The emigrants thought it safe to return to Makkah. Only when they arrived did they realise that this was another shrewd plot by their enemies. They were again forced to flee for their lives. This time eighty-three Muslims left for Abysinnia. It is acceptable for Muslims to move away from a place of danger in fear of their lives. This is because when they are few and weak they can regroup in an area of peace and escape the torture of their enemies. Negus’ acceptance of the truth of Islam showed that the link between divine religions of truth is great. As a united group their followers can be stronger than those who disbelieve or associate partners with Allah. This link is stronger than one based on friendship, blood or homeland, while disobeying Allah. The deceitful plotting of the Quraish showed that the enemies of Islam will never stop planning. Whenever one avenue closes on them they will seek others to weaken the Muslim resolve. The Muslims were caught by the false rumours spread by the Quraish and returned to Makkah. From this they learnt that it is always important to clarify the source of information. One should never act on the basis of rumours. The disgraceful departure of the Quraishi delegation proved that those who oppose Allah and His servants can never be successful in this world or the hereafter. Negus displayed his integrity and fairness by allowing the Muslims to defend themselves.